Beats Electronics may be looking to partner with AT&T, according to a report today, as the headphone manufacturer readies its streaming music service, Daisy. 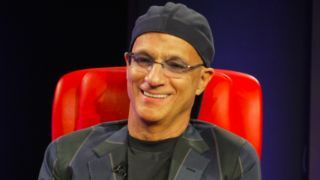 Jimmy Iovine, the company co-founder who isn't Dr. Dre, is said to be talking with executives from major music labels and AT&T, claim sources who spoke to CNET. Beats is also expected to use technology from MOG, the music on the go subscription service that is bought last year. The popular Beats brand combined with this proven technology could be an incentive for AT&T and other carriers looking to enter their data-requiring customers into more subscription-based plans. A major partnership would also help Beats Electronics establish a foothold in the streaming music industry, where there is already intense competition. In addition to Apple's upcoming iTunes Radio, there are several well-established subscription-based services available right now. This includes Spotify, Pandora, Rdio and Google Music All Access. The difference, according to the report, is that Beats' Daisy service could use its music industry connections to include playlists designed by humans and not just algorithms. Having the hottest acts, including widely known DJs, put together mixes would lend Daisy some star power that would make its streaming music rivals jealous.